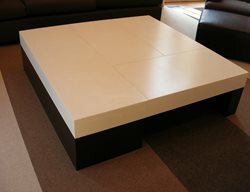 A uniquely shaped concrete coffee table, consisting of four hollow pieces, making it easier to move. 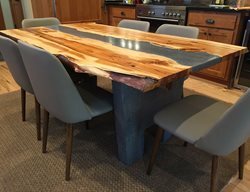 Read about how this unique concrete conference table was created. The four sections in the center of this table house electronic outlets which turn over at the push of a button and expose plugs and data ports. This table measures fourteen feet by four and a half feet. Originally, the clients wanted it cast in one seamless piece, but for practical reasons, such as fitting in the elevator and reducing the weight, it was cast with a seam. 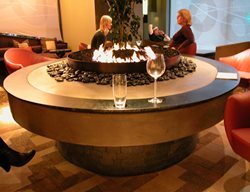 To make the seam a design feature, a stainless steel rod was added to support a recessed steel disc in the center of the table. The circular feature is water tight and can be filled with floating flowers and candles for a unique party centerpiece. 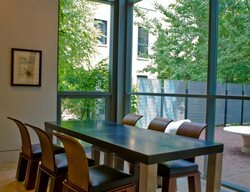 The table was made with Surecrete Xtreme GFRC in gray and sits atop a frame by Carson Maddox, a local furniture designer in Chicago. Concrete chair submitted for a local chair design competition. 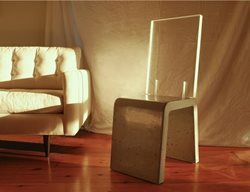 The seat and back are solid concrete and the arms and legs are powder-coated steel. It is suitable for indoor-outdoor use. It weighs approx 90 pounds. 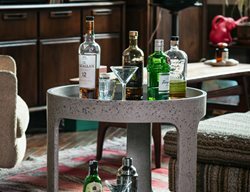 This center piece for a residential wine room is a hand carved concrete table base that resembles a tree stump. 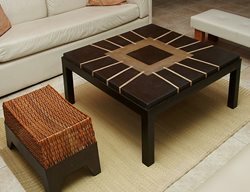 This branch coffee table has become a popular item, as each one has its own uniqueness to it. This is a 25” x 50” concrete table and inlayed with a planed down ash tree branch that was found on the forest floor near our facility. The mix was poured, vibrated, and hand troweled for a unique, textured look. 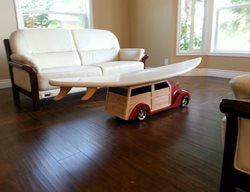 This residential concrete table had a unique twist added to it. An antique marble checkerboard was inlaid into the surface of this table during the casting. 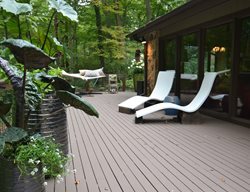 The concrete was integrally colored with caramel and the surface completed with an exposed aggregate finish. 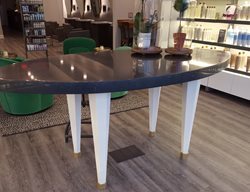 This concrete coffee table was precast and colored using both integral color (sage) and acid stains (carmel & black onyx) to give it the two tones. These modern tables have polished stainless steel legs and beige cast concrete tops. Read more about these tables. Nature inspired table with custom, crushed granite mix and brass flakes. 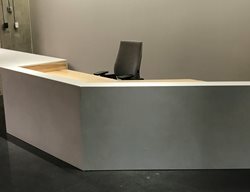 Seven-foot long reception desk. Fabricated in three pieces. This boardroom table for Zom International was designed by Thomas Jagger with direction from Hunter Glass. The base and top edges are clear powder coated steel. The top is made of two panels for design and ease of transport. One panel is brown / black tortoise shell, the other is weathered bronze brushed for a moving effect. The river is copper patina and aqua blue. The table weights 1500 lbs.